This lovely Golden Deer Embroidery Kit is available in several different ways - as printed fabric, and as a kit, with or without the hoop. Isn't the effect of the gold floss just beautiful? Well, we've come to the end finally of our Christmas Countdown - I hope you enjoyed each day as much as I did, that you found new inspiration, new shops and friends to follow. 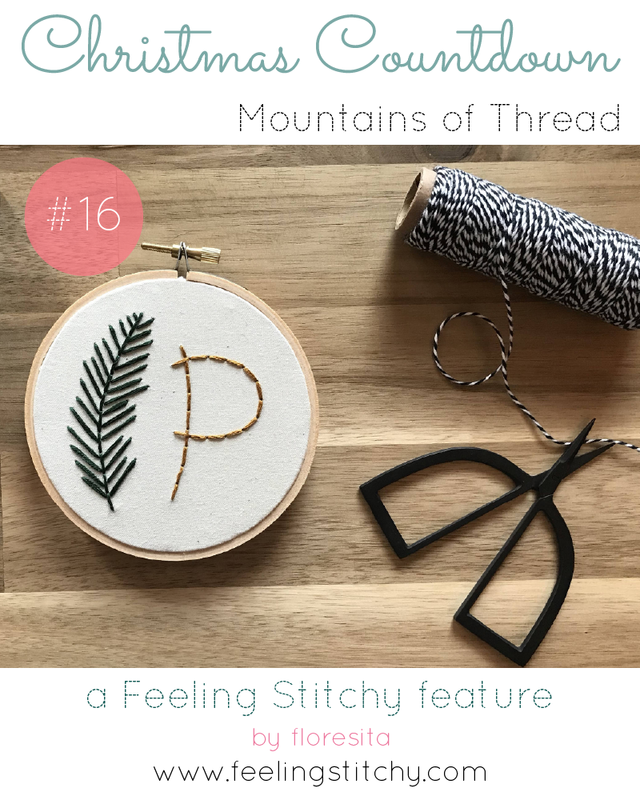 Here at Feeling Stitchy we wish you the blessings of this season and the new year to come, may it be happy, golden, and filled with love and craft! Loving this festive Merry and Bright Embroidery pattern by Sew Jenaissance - lots of fun colors and and items to stitch! Love this Home Sweet Home pattern by Linen Thread Timber - the colors and textures make my heart sing - just lovely. 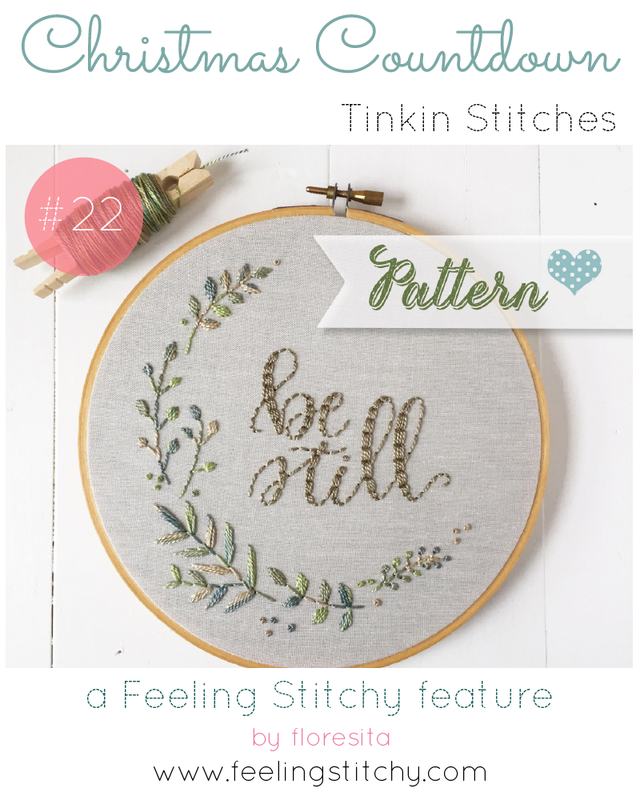 Not sure why but I am all about the muted palettes this year - and this Be Still pattern by Tinkin Stitches has been calling out to me all season. I love the shiny use of pearl cotton in this piece. 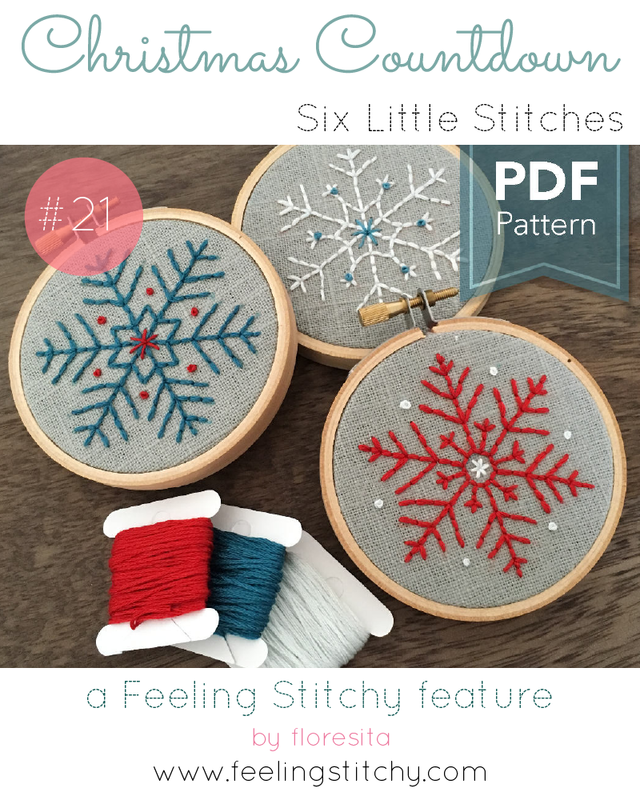 Simple but sweet, this Modern Snowflakes Patterns looks lovely - I love the red and blue color palette! This free Winter Flower Stocking Pattern by Purl Soho is just gorgeous - and a wonderful way to craft something personal and elegant for someone new in your family. Home Alone fans? You'll like this Free Christmas Ornament Pattern by Cutesy Crafts, say Merry Christmas Ya Filthy Animal, to whomever you please. Hello there! One of my favorite embroidery techniques is Kamal Kadai work. My previous attempts at Kamal Kadai, I stitched flowers using 6 strand cotton floss. I was curious to see how different it would look with pearl cotton and using two colors. To start, I referred to this photo tutorial. I drew a 3.5 inch by 3.5 inch square with a water soluble pen onto my fabric. Find the center of the square - draw lines and create 4 boxes within that square. Then I made a mark every 1/4 inch - so there were 6 marks total between the middle box line and each corner ... hopefully that makes sense and the photo helps with the explanation! 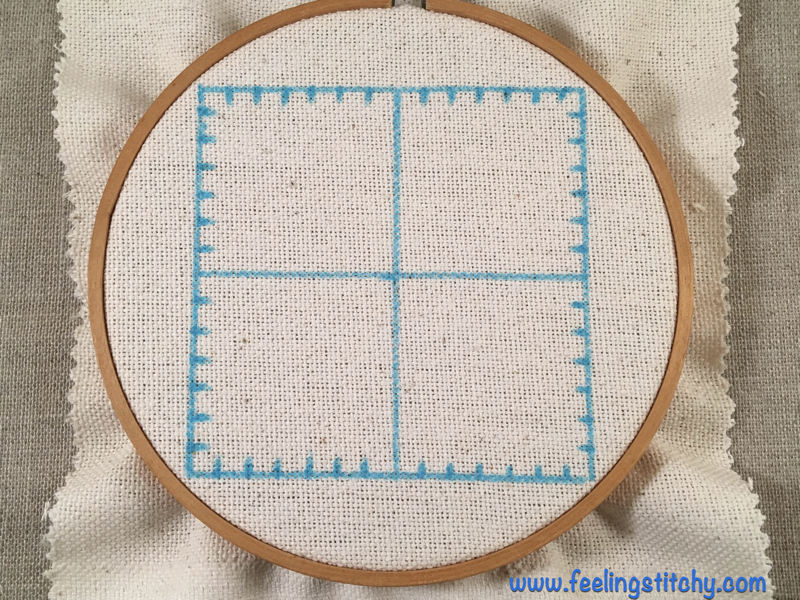 Starting from the lower left square, bring your needle up from the top mark and stitch over the lowest mark on the upper right square (as seen above). 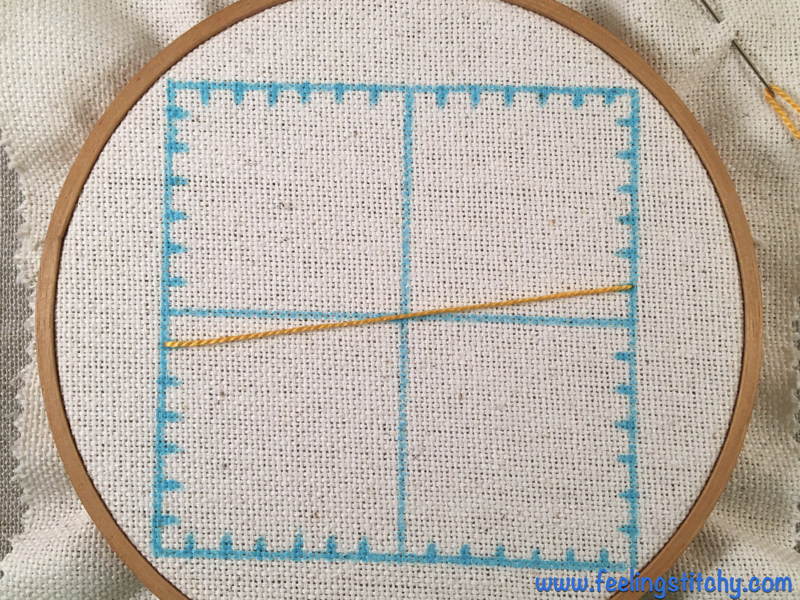 Continue by stitching from the next mark in the upper right square and stitch down to the next mark in the lower left square. 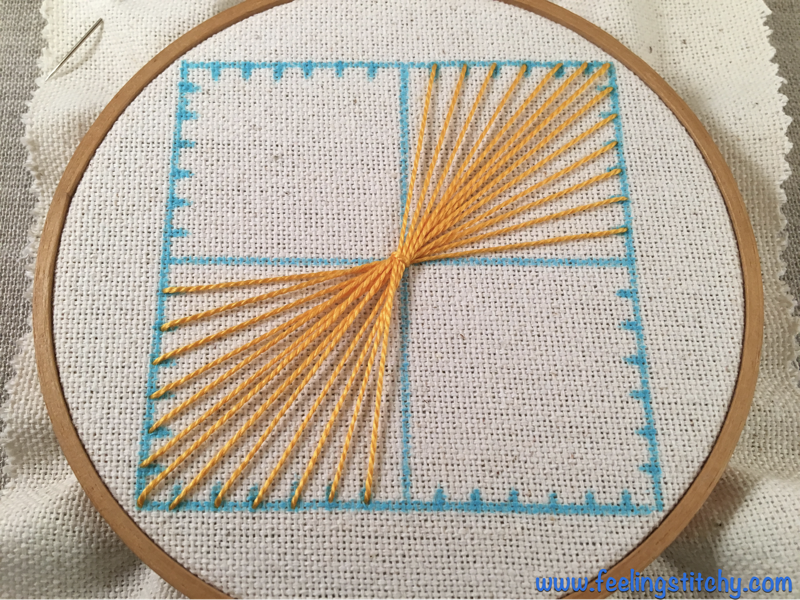 Keep doing this back and forth until you finish stitching to each mark (as seen below). You will then want to couch down in the middle. 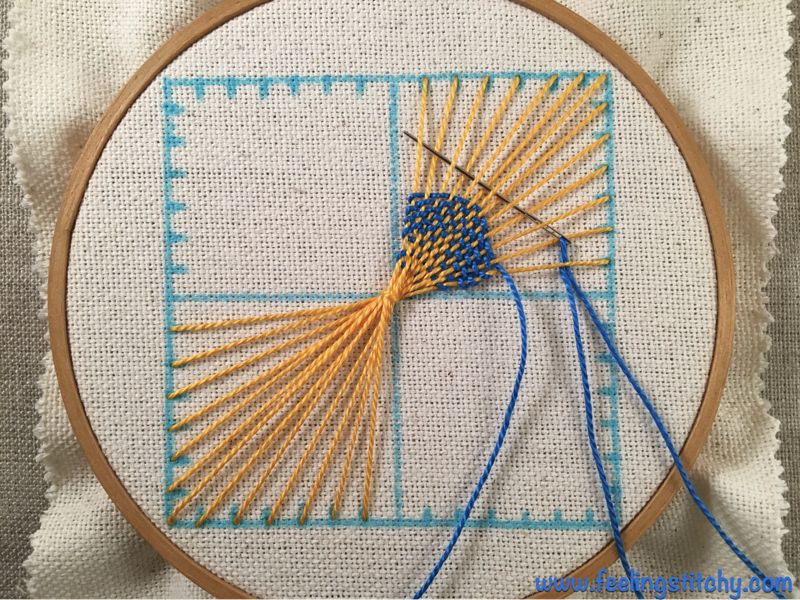 Now it is time to start weaving with your second color. 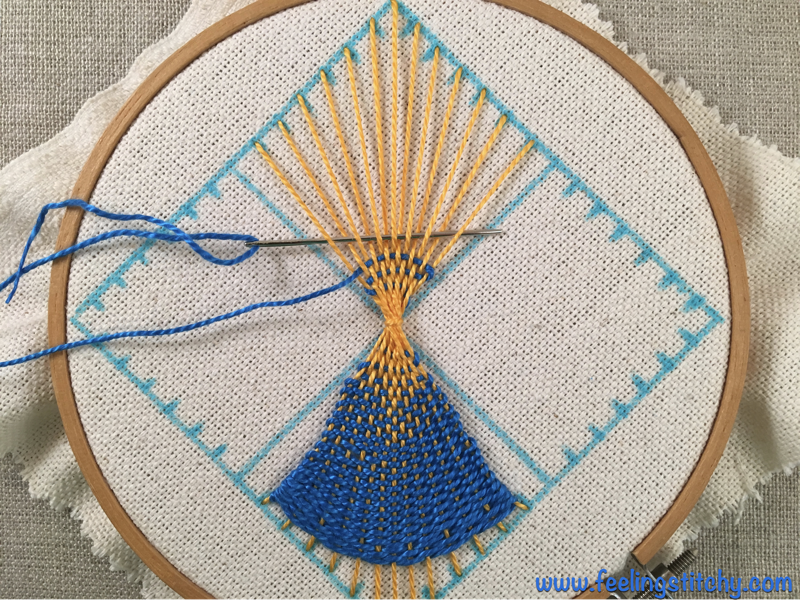 If you want to see a more detailed tutorial on how to weave - check out my first Kamal Kadai flower post for more step by step instructions. 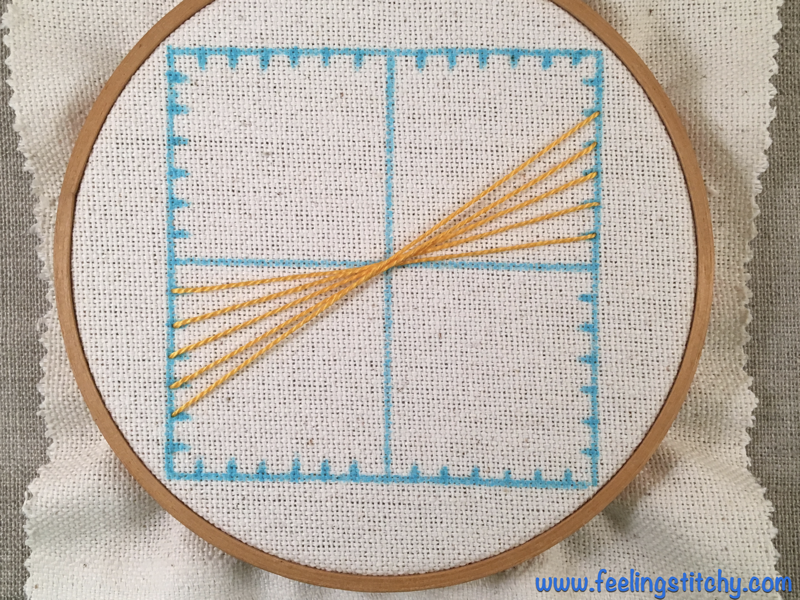 Once you have weaved both squares, you will repeat the steps. Stitch your lines and couch them down in the middle. All finished weaving! Now my favorite part - removing the pens lines with water! 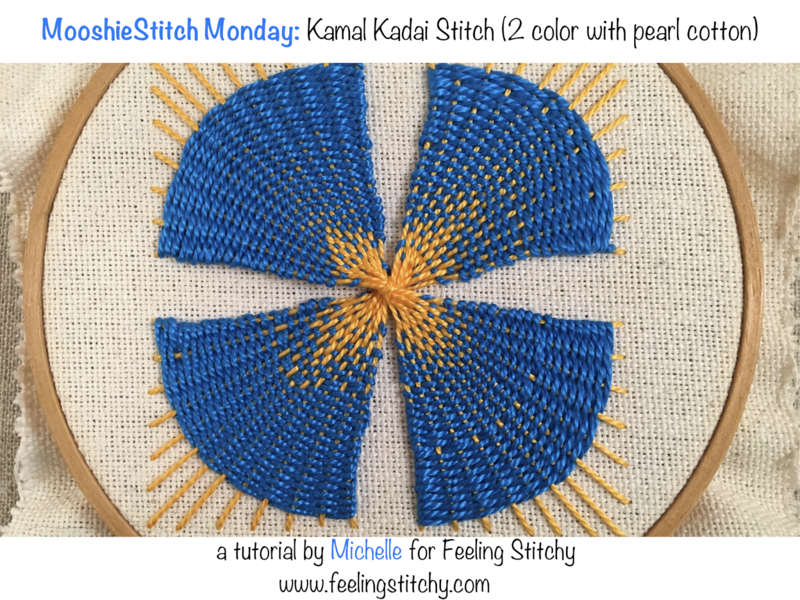 There you have it - two color pearl cotton Kamal Kadai stitch. I really liked how this turned out. I think pearl cotton is much easier to use for this stitch than the cotton floss. 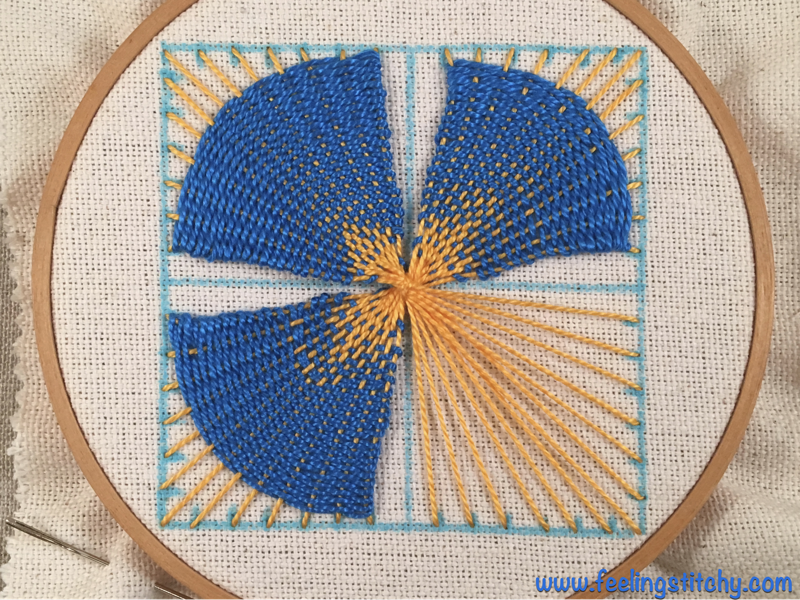 The two color effect is great for this stitch also - I now want to try it with other colors. Black and white would be cool or green and red for Christmas! 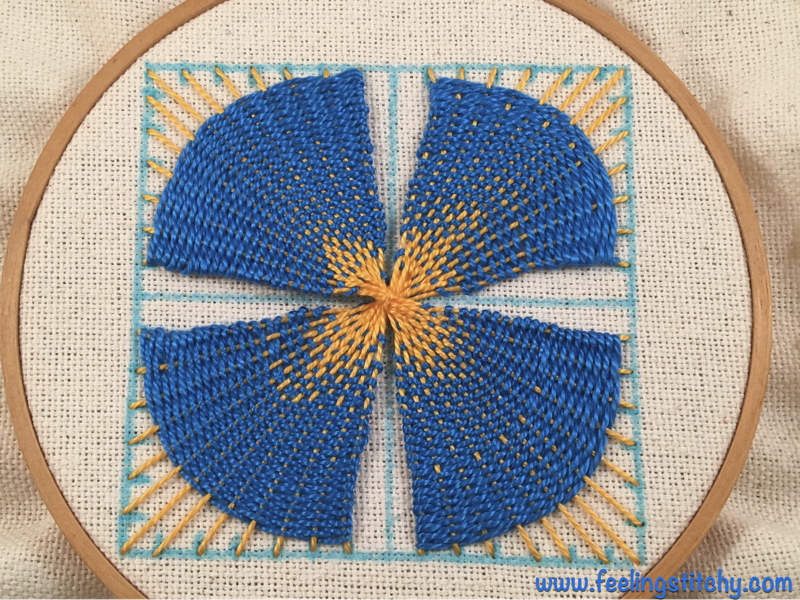 If you want to see my other version of the Kamal Kadai flower in cotton floss - check out this post! This sweet Monty Mouse Ornament Pattern by Catherine at Bumpkin Hill is delightful. Catherine is also offering a bundle of all her felt ornament patterns as well, check her shop to see them all! 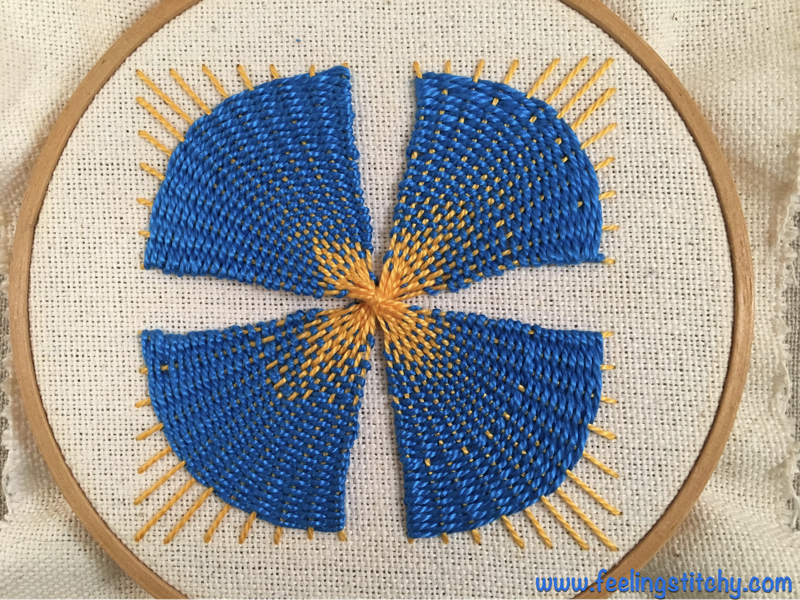 Some of you may have missed this beautiful Plushwork Wreath Tutorial by Michelle last year, since it came a bit late in our December schedule. Well, you really can't miss it, and I think you'll love creating a few of these, for sure! It's a good warm-up, as Michelle has a brand new tutorial ready for tomorrow! I love this sweet, simple Christmas Monogram Embroidery Kit - it's such a fresh, uncomplicated design, with a lovely muted palette. If you have never crafted with wool or wool-blend felt, I highly recommend trying Benzie Design on Etsy - this beautiful Guest Curated Felt Bundle can be purchased in 6 different colorways, coordinated to match the Mmm Crafts 12 Days of Christmas Patterns. 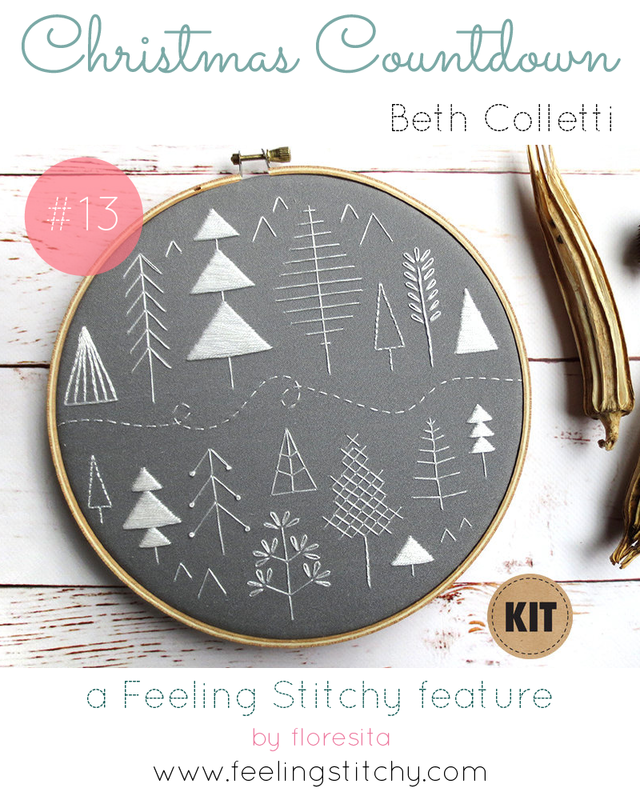 I've purchased this felt bundle myself, and it is gorgeous and well worth a try. If you're looking for Christmas palettes that are unique and more vibrant than the typical red and green, this is your ticket! 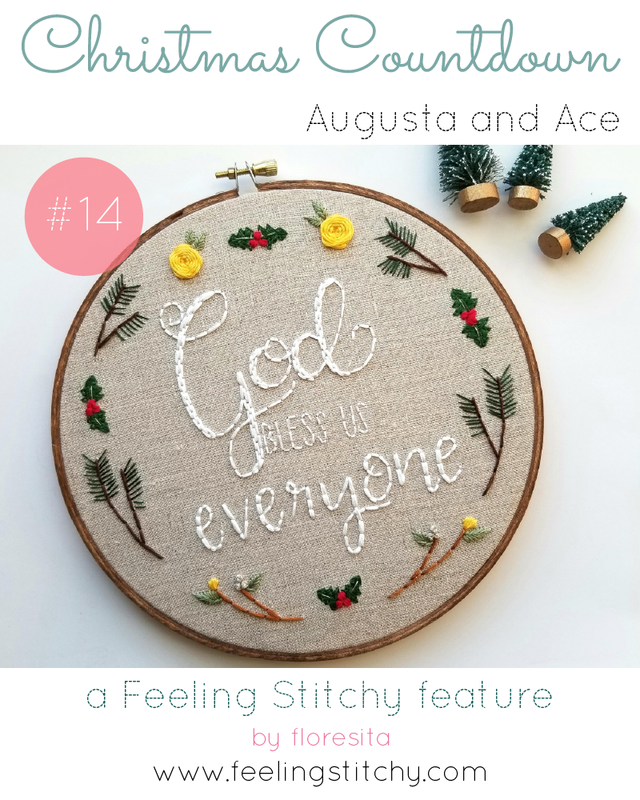 This God Bless Us Everyone hoop by Augusta and Ace is made to order, and just perfect, in my opinion. Love the colors and sweet little details - lovely! 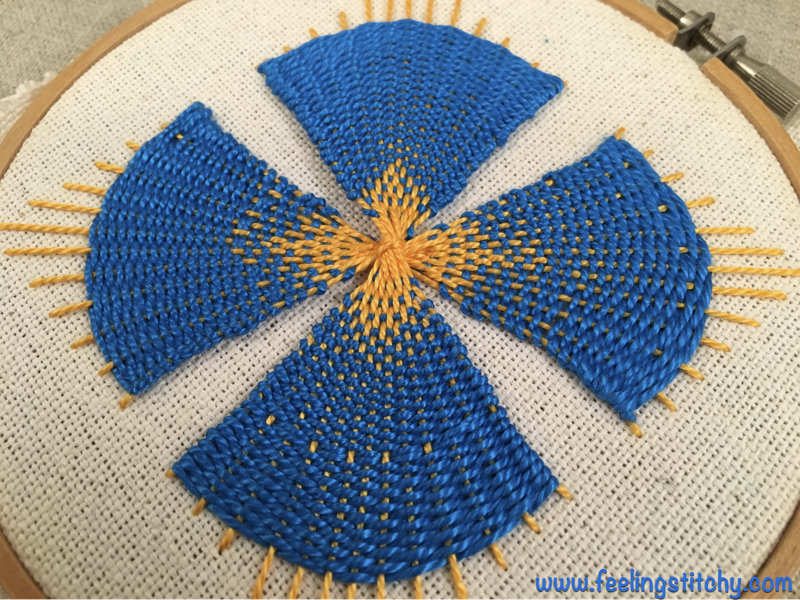 I am thoroughly loving this Merry and Bright Cross Stitch Kit designed by Homestitchness for Colour and Cotton. The bright pastel thread colors and cute trim make a perfect little piece or tree ornament. 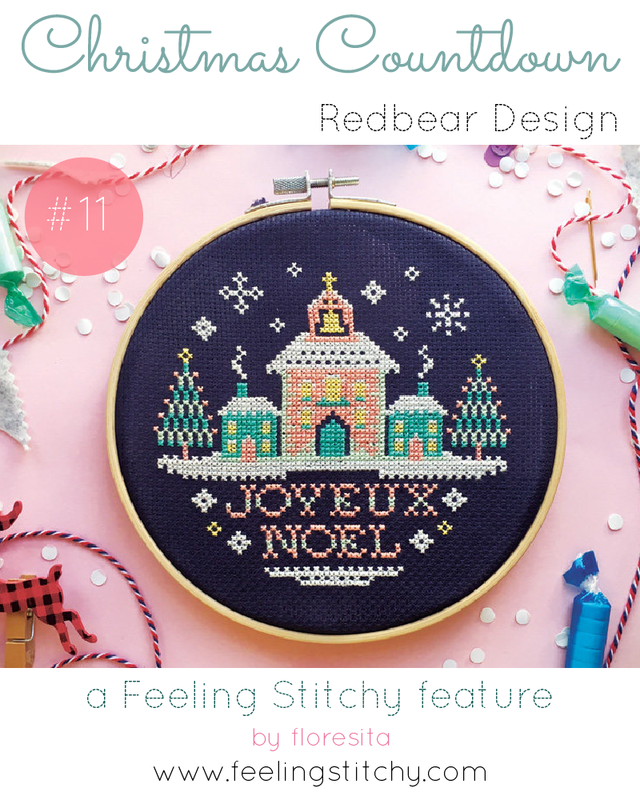 I love this Joyeux Noel Cross Stitch pattern by Red Bear Design - I really enjoy pastel tones and a break from the usual bold colors of the season - and this palette just does the trick. If you're looking for an elegant, simple tree skirt to make, this Free Fleece Pointsettia Tree Skirt tutorial is just the thing - found on the wonderful crafty blog Craftiness Is Not Optional. 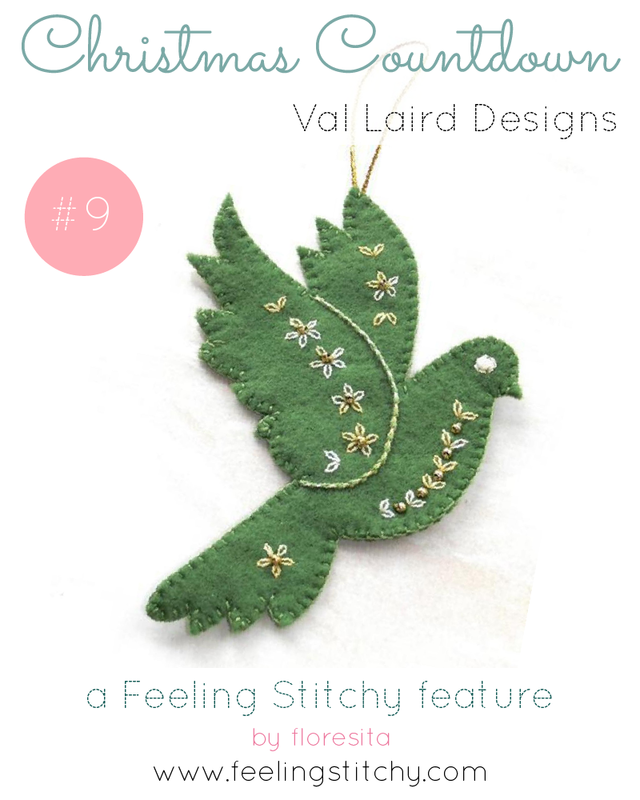 I couldn't help but be charmed by this Free Christmas Dove Pattern by Val Laird Designs. 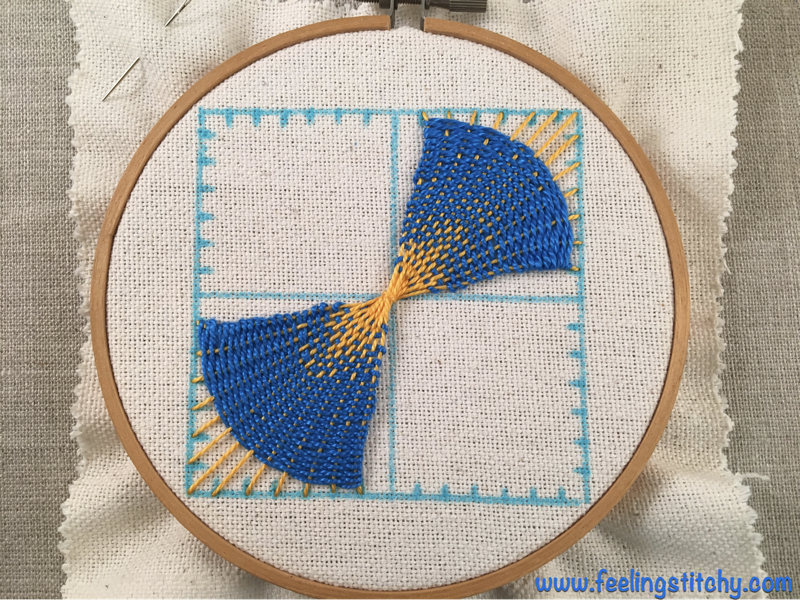 Just a few simple stitches can transform this sweet pattern in so many ways! These Christmas pocket patterns by Nancy Nicholson Design are so sweet - I love the colors and variety of stitches. How cute are these little Felt Gnome Santa patterns by Roxy Creations? This looks like hours of delight with little pieces of felt and fuzz - perfect! 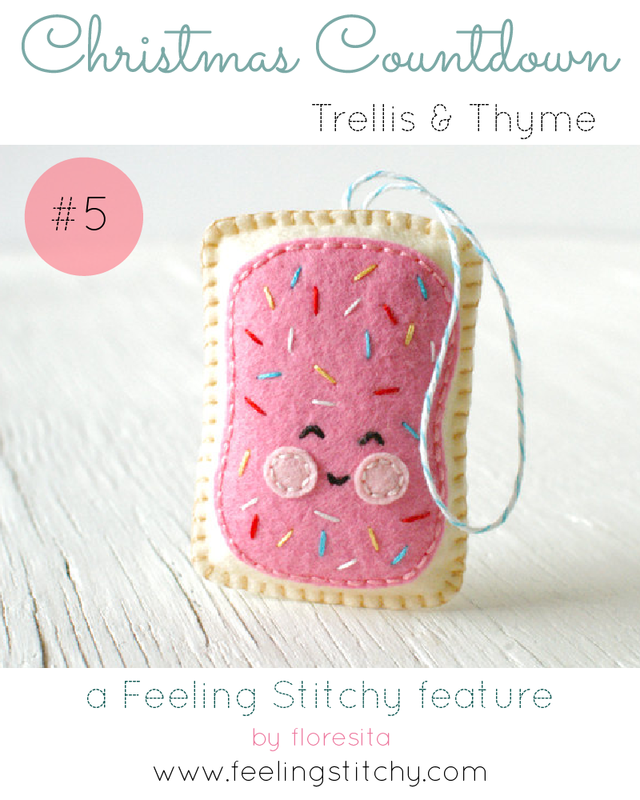 I am always charmed by Trellis and Thyme's holiday offerings, like this sweet Frosted Tart Ornament pattern - I love the idea of simple little ornaments that can be stitched up quickly as gifts or during quiet moments with family. This Folk Holiday Kit by Cozy Blue is just lovely, isn't it? 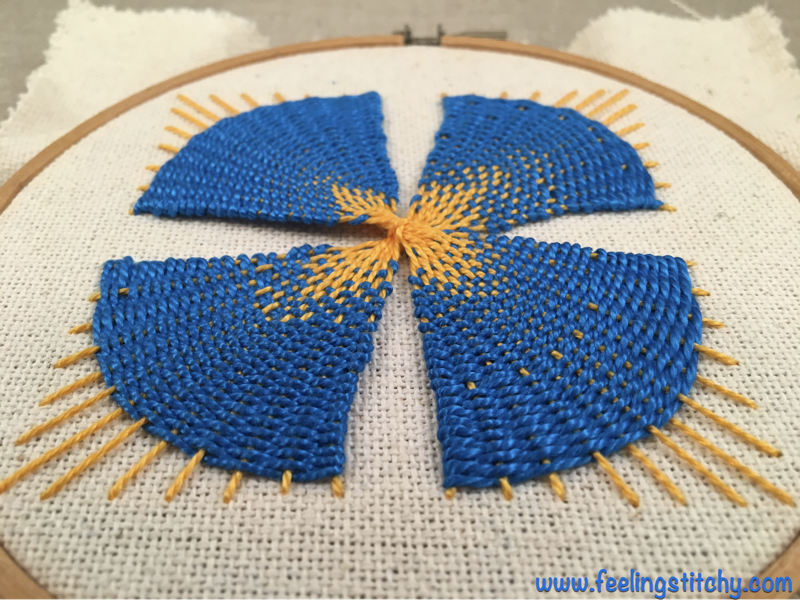 I love the golden-mustardy color of the pre-printed fabric, and having the option to do this up in simple white or go a bit crazy with colors, as you are inspired. 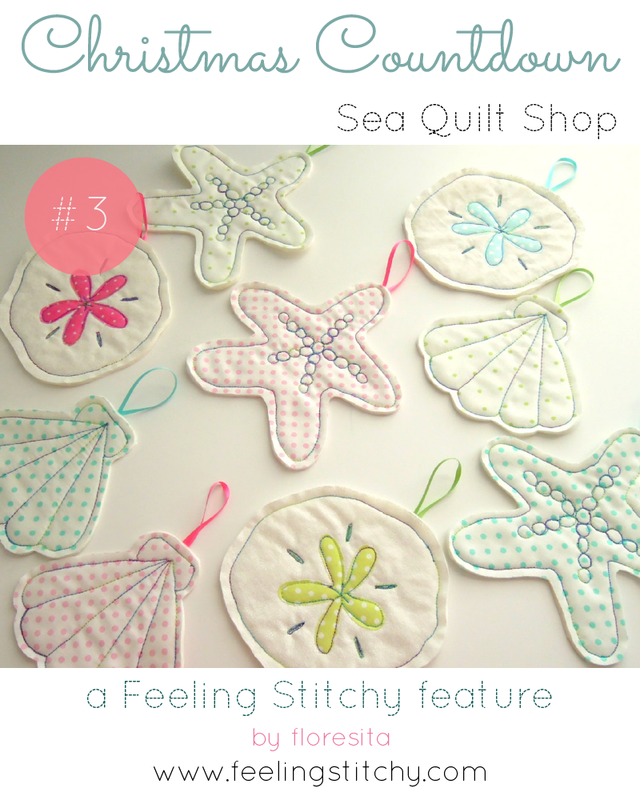 I adore the un-fussy sweet simplicity of these Coastal Tree Ornaments in the Sea Quilt Shop. I also love the light, sherbet fabric colors and the sweet stitch details - just lovely! 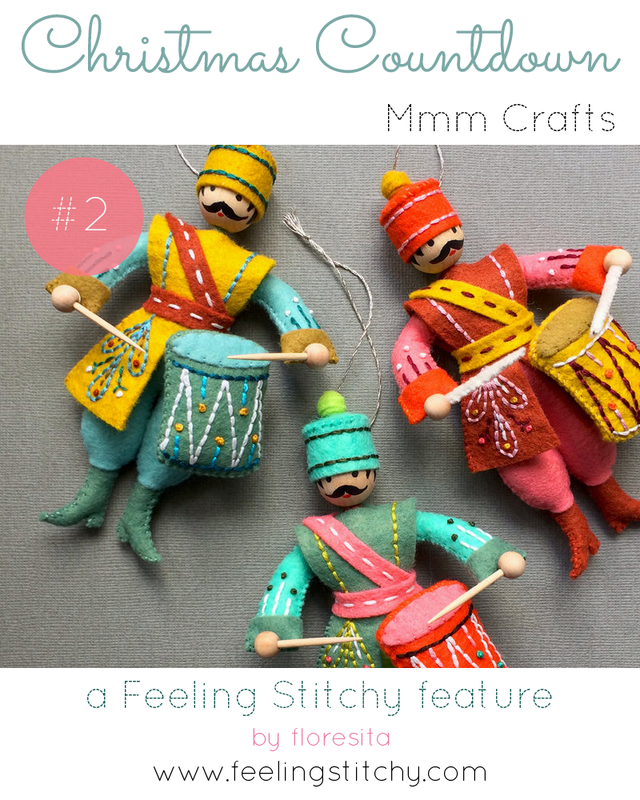 It's become a holiday tradition for me to pop over to Larissa Holland's beautiful Mmm Crafts shop to see what she's created next in her 12 Days of Christmas series - this year, it's the sweet Drummers Drumming and Pipers Piping patterns. I also highly recommend the matching felt sets from Benzie Design - once you've used them, you'll never want to craft again with simple craft felt! 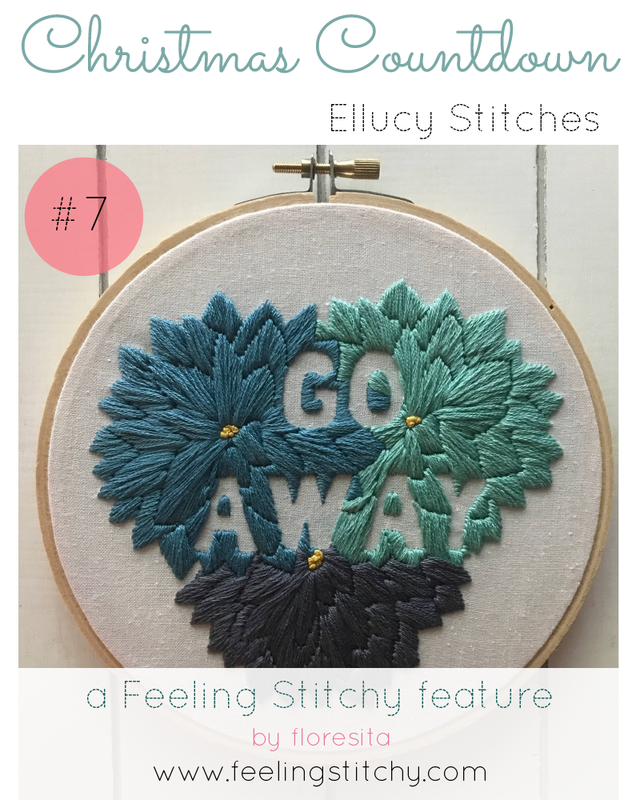 The annual Christmas Countdown on Feeling Stitchy begins! Every day up to Christmas, I will feature lovely patterns, kits and ornaments to get you into the holiday stitching spirit. 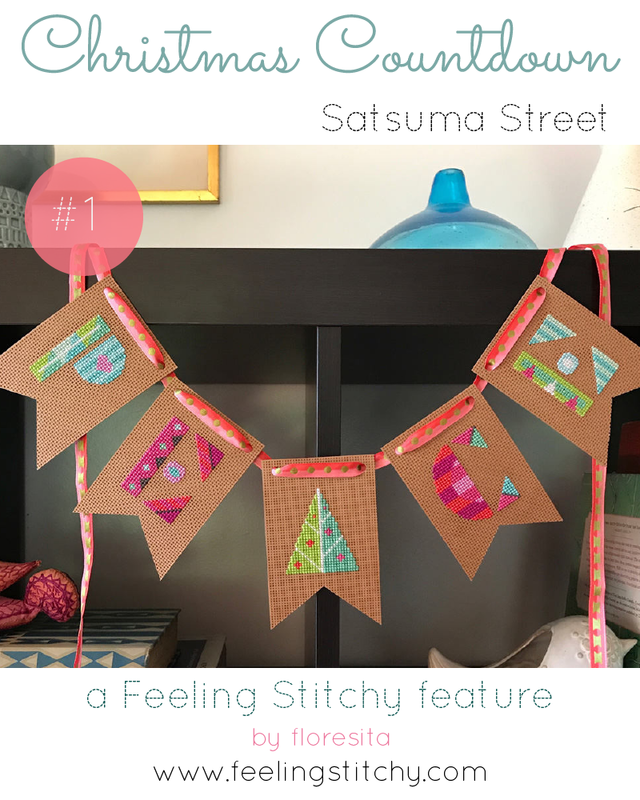 First up is this Peace Banner pattern by Satsuma Street, who never disappoints - every year a new lovely holiday pattern in unexpected colors and lively textures. 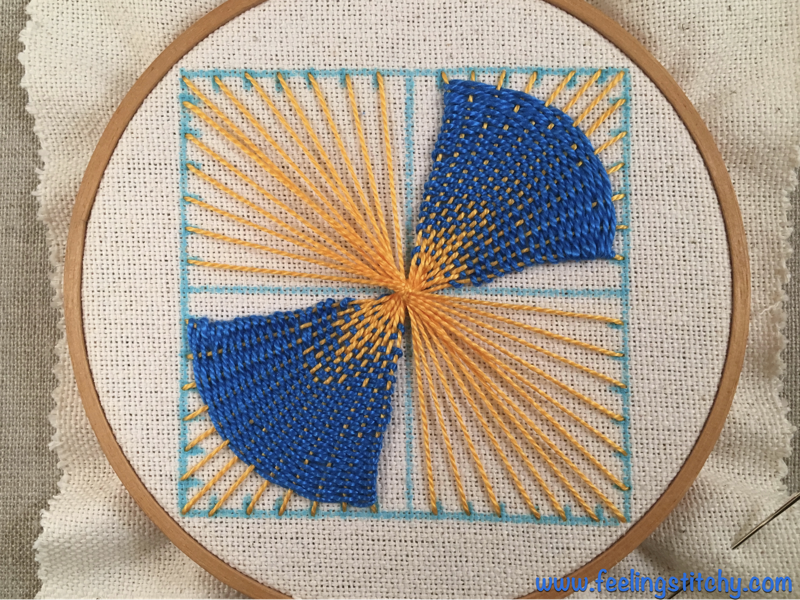 This can be ordered both as a downloadable pattern, or as a kit. Can you believe it's December?! How did 2017 go by so quickly? 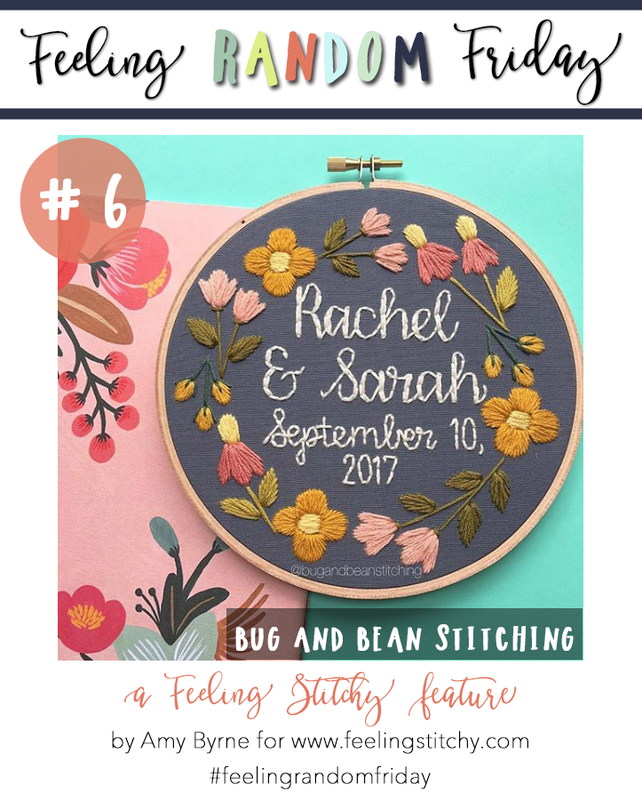 Let's take a look at Bug and Bean Stitching today! Marley is a hand embroidery artist whose work is beautiful! I picked the particular picture above for a few reasons, 1) My wedding anniversary is September 10, 2011 (09/10/11), 2) That shade of blue in the background is pretty similar to what's on the walls of most of my house, and 3) If I'm not mistaken, that's a Rifle Paper Company pattern on the left. I really like her style!